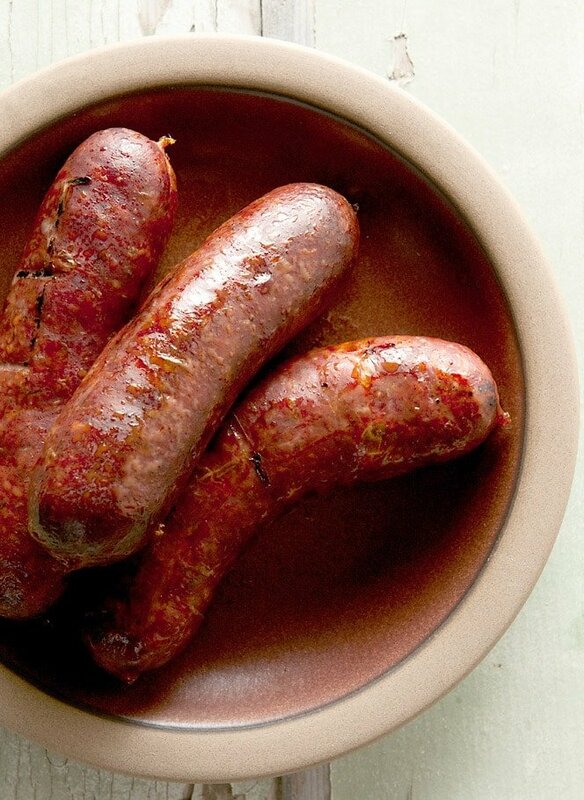 Along with the hot dog, andouille is the quintessential American sausage. And like the hot dog, it too has its origins in Germany, even though with a French name it sounds counterintuitive. So far as I can tell, Louisiana style andouille sausages are a product of early German immigration — and when I mean early I mean the 1750s, when Louisiana was part of France. Both Germany and France still have versions of andouille, but the American variety has been evolving independently for centuries, and no longer resembles its ancestors. Andouille is a Cajun food, most at home in southern Louisiana, but it also appears a lot in New Orleans Creole cooking, too. It is almost always smoked and heavily seasoned. What makes an andouille unique? Typically onions, garlic, cayenne or other hot chiles, black pepper and usually thyme. Normally andouille is a pork sausage, but I rarely work with domestic meats. So my homemade version is a melange: Venison, bear meat and pork fat. Why? It’s what I had lying around in the freezer. Frankly, andouille is so heavily spiced and smoked you can make it with whatever meat you have on hand. There is no reason you can’t just eat an andouille sausage: A link served with green peppers, minced celery, onions and Creole mustard would be damn good. But it is typically tossed into other dishes, like gumbo or jambalaya. Any Louisianans out there? How is your andouille different? I’d love to hear about your variations. 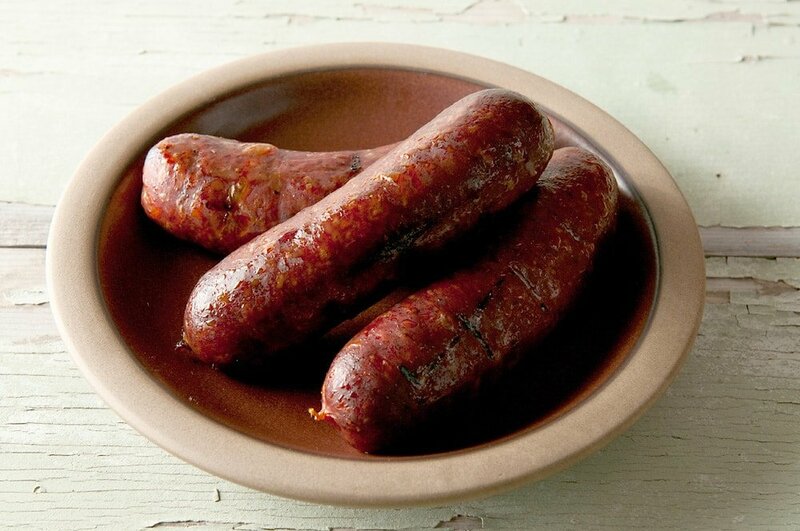 Although fresh versions do exist, if you are looking for that authentic andouille flavor, you’ll need to smoke your sausages. Pecan or hickory wood are classic fuels, but apple or walnut or even oak will be fine. Once smoked, these will last in the fridge a week or so, and they freeze very well. Remember these will be cooked sausages, so once you decide to use your andouille you’ll just be reheating them, not cooking them. For hunters: If you are starting with frozen wild game, you can thaw it, make these sausages, smoke the links and then refreeze them. So long as you cook them to an internal temperature of at least 150°F, the texture of the sausages will not suffer too much. 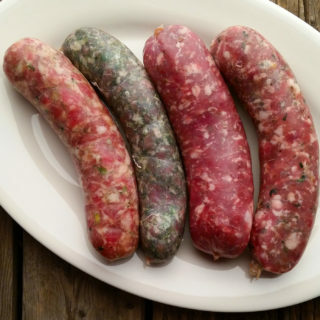 If you are not familiar with making sausages at home, I wrote a basic tutorial on how to make sausage on my friend Elise's website, Simply Recipes. If you are smoking these sausages, you'll need the curing salt No. 1, which you can buy online. Heat the lard or peanut oil in a small saute pan and cook the onions over medium heat until they are soft, translucent and slightly browned on the edges. Remove from the pan and let cool. While the onions are cooking, take about 10 to 15 feet of casings (typically three lengths) and submerge them in warm water. Make sure you remove as much silverskin as possible from your meat. Cut the meat and fat into 1 to 2 inch chunks and toss with the salt, Instacure, dry milk, garlic, cayenne, paprika, clove, allspice, thyme and powdered mustard. You need the Instacure No. 1 as a safety measure when you smoke the links; if you don't plan on smoking them, you need not use this. You need the dry milk to help the links hold onto their moisture: If you skip this, they will still taste good, but they will shrivel up when you chill them. Put everything in a container and freeze for 30 minutes to 1 hour, or until the mixture is 35°F or colder. Grind the onions, meat and fat through the coarse die. (If you are using the KitchenAid Food Grinder set the mixer on the No. 4 speed) Andouille is most typically a country-style, coarse sausage. If you want, you can even hand-mince the meat yourself. TIP: Hand-mince 1/4 of the meat and fat mixture to get a more interesting texture for your sausage. Make sure the mixture is very cold, about 30°F; you will probably need to freeze it again for a while. When it's cold enough, take it out and add the chilled red wine or beer to the bowl and mix on the lowest setting for 90 seconds to 2 minutes, or with your very clean hands for 2 minutes. This turns what was essentially flavored ground meat into a cohesive sausage. The look of the meat will change as it binds to itself, and will look more like thick batter than ground meat and fat. If you are making patties, you're done. Store each patty between pieces of wax paper and then wrap tightly in plastic wrap, then foil, before freezing. 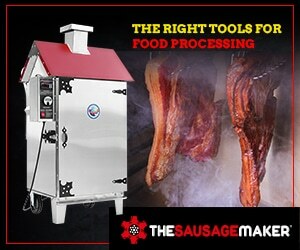 If you are making links, load up a sausage stuffer with the meat and fat. Rinse the casings by running warm water through them: You want to flush some salt and check for any holes in the casings. Thread an entire casing onto the stuffer and fill it slowly. Coil the filled casing as you go. Fill all the casings before making individual links. To make individual links, tie off one end of a casing. Compress the sausage inside it to fill that end link. Pinch off a length of link with one hand, and another link with the other to create a second link next to the end sausage. Flip this second link over to create the sausage. Gently compress the meat in both the end link and this second one. Flip the second link over several times to tighten it. Move down the coil and create two more links. This time, flip the link back toward you to tighten it. Repeat this process down the coil until you get to the end. Tie off the end link. Repeat with all the other casings. Hang your sausages to dry for an hour or more. Hang for 1 to 2 hours at room temperature, or up to overnight where your temperatures are below 45°F. I use a standard clothes drying rack to hang my links. When the sausages are hanging, use a large needle to pierce any spots on the links where there is air trapped underneath. Sterilize the needle in the flames of a gas burner or with a lighter until it glows. You need to pierce any trapped air or your links could burst when you cook them. Once the sausages have hung, smoke them for at least 3 to 4 hours. If you hot-smoke your links, pull them when they reach an internal temperature of 155°F. If your links don't get to that temperature in time, you can either smoke them longer, or you can finish the cooking in an oven set at 200°F. Once they're fully cooked, let them cool before freezing. Find dozens of recipes for fresh and smoked sausages, from brats to Italian to kielbasa and much more, here on Hunter Angler Gardener Cook! Howdy there. Just curious; why the dried mustard? Recipe looks fantastic! Actually, Andouille is reported to have originated in France and was brought to the US by the immigrants who would become the Creoles. John: In name only. The actual sausage has more of a German influence. I did a lot of reading on this, and I was surprised to learn of the German influence, too. When these are done in the smoker, should they be plunged into ice water (like in Kielbalsa recipe), or allowed to cool slowly. The Kielbalsa shrinks a lot if cooled slowly, but the plunge keeps them plump. Wouldn’t the same principle work with these sausage? Scott: It does, and yes, I do that sometimes.